[SatNews] MaxLinear Inc. (NYSE: MXL) announces their OEM partner, ProBrand International, has started volume production shipments of the next-generation digital, channel stacking, low-noise block downconverter (LNB) based on the industry-leading MxL801 Ku-band satellite down-conversion RF IC and MxL862 channel-stacking system on chip (SoC). This LNB was first announced in January 2015 at CES and has now launched on the market, highlighting a key milestone for both companies. The turnkey nature of the MxL801 and MxL862 devices, coupled with MaxLinear’s integrated software stack including the EN50494/EN50607 standard protocols, and ProBrand’s innovative, compact design enabled ProBrand to complete the patent pending, low-cost product in a record short period of time and without any compromises to quality. The new LNB can be configured in either static mode, delivering a fixed number of channels, or in dynamic mode, which enables channels to be added or removed, or in hybrid mode. In hybrid mode, operators can choose to configure the LNB with a fixed number of channels as well as having some of the channels dynamically allocated. As operators expand their transponder capacity, the hybrid LNB can be easily reconfigured to accommodate new channel line-ups. 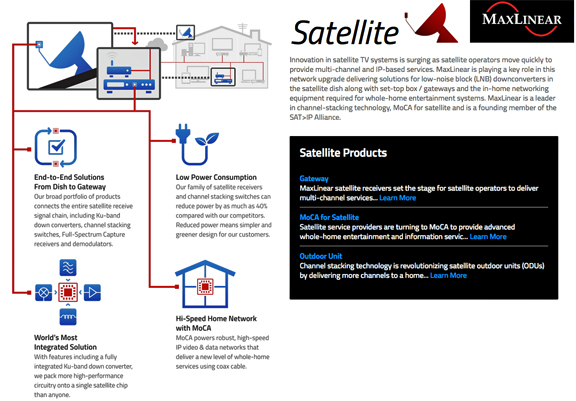 In addition, the software supports concurrent operation of multiple control protocols, providing complete flexibility to operators for seamlessly deploying advanced multi-channel set-top boxes and media servers while ensuring coexistence with legacy receivers connected to the same coax cable. The MxL801 RF IC is the industry’s first monolithic Ku-band down-converter implemented in digital CMOS. The single-chip solution enabled ProBrand to replace dozens of discrete components, including the image reject filter, thus improving system reliability and eliminating the need for performance tuning in production. The digital PLL-based implementation allows operators to achieve channel drift performance of +/-0.5MHz, compared to +/- 2MHz for a traditional DRO-based implementation, resulting in higher usable bandwidth per channel without incurring additional costs. The MxL862 is a field-proven, market-leading, digital channel-stacking SoC optimized for single-feed satellite platforms. Based on MaxLinear’s ultra-low power Full-Spectrum Capture™ technology, the MxL862 integrates a bank of programmable channel select filters enabling a stacked output of more than 32 channels. The MxL862 is part of the MxL86x product family of digital stacking SoCs. The MxL862 is optimized for single-feed LNB applications. The SoC provides a flexible and very cost-effective digital channel-stacking system solution, including the EN50494 and EN50607 standard protocol software for single-cable distribution. The device can also be configured in universal L-band switch mode for backward compatibility with legacy STBs and with dish alignment measurement equipment typically used by installers.